We are a British Hang Gliding and Paragliding Association (BHPA) registered school. As such we teach the official syllabus in accordance with the BHPA technical manual. 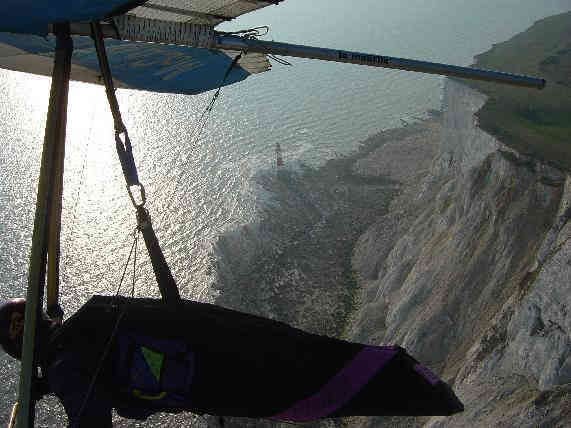 All instructors working for South Downs Hang Gliding are current BHPA licensed instructors. After the first two introductory days, where tether ropes are used to assist the control, the student must agree that they are responsible for the safe conduct of further flights without tethers and should be confident to do so. It is understood that the instructors have no further direct control over the glider. The role of the school is to provide the equipment and access to sites where the student can attempt the BHPA flight training exercises. The course fees covers this and other administrative costs. The instructors supervise the use of the school equipment and provide theoretical instruction and practical demonstration. The student should utilise any such instruction to minimise their personal risk when attempting the flight exercises. We teach hang gliding in good faith because we love the sport and want to help others learn to fly these amazing machines in a safe and responsible manner. Hang-Gliding can be a dangerous activity. All students will follow the training exercises described in the BHPA Student Training Syllabus. BHPA licensed Instructors role is to supervise use of the training site and school equipment. Students will inspect the training site and equipment before use. Instructors are trained in First Aid but have no extra duty of care than others present. Students accept all risks associated with learning to Hang-Glide.